Did travelocity disable their flex dates option? I can't seem to pull it up, however I am using a new computer so maybe I am not doing the search correctly. Can anyone confirm? I noticed the same thing a few minutes ago and sent an email to them. 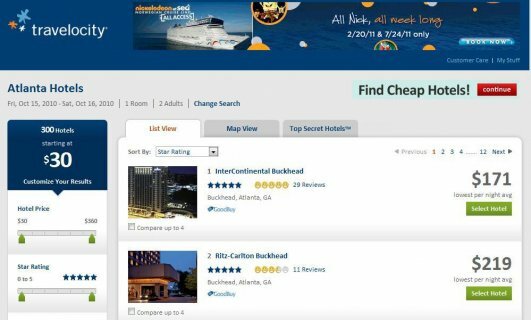 The flexible date search was one of the most useful things about Travelocity after the removal of their dream maps feature. Farewatcher is now useless, too. This is not good news. What are people doing now to find low fare days in the out term?? Yep, the farewatcher emails are now worthless. I'm done with Travelocity. It was great while it lasted. Used to be a great site, booked a couple of times with them. The new changes are a great disappointment. Travelocity stated that the flexible fare search would have been a violation of the new government requirement that the total fare be disclosed up front. Sadly, it seems that they would be correct...there was no way to show the total fare before you clicked on the fare and picked specific flights. It used to be a great tool I used along with ITA Matrix. I am not sure, but is it possible to write a new algorithm to compare "fare plus tax" and then display the result in a flexible calendar? Is there really no way to do that like you said? The data users enter will contain originating airport, destination airport and departing month, as it used to be. Then the program search for all possible fares within the next few months of the departing months user entered, then add the corresponding tax to fares, and then sort the results in ascending order, and, finally, return, let's say, first 50 results with flight info, date and time. Hope those at Travelocity are working on something like that. I agree, and this is the really the only reason I'm slightly disappointed by the new requirement the DOT instituted. I know it's probably for the best in all other cases, but this one special case should be exempted somehow.